Patrick Melrose (Benedict Cumberbatch) is a British addict who learns of his father David’s (Hugo Weaving) death. Patrick tries to give up heroin, in honor of his dad’s passing, does he succeed? He also tries to date his girlfriend’s friend Maryanne. (Allison Williams) How does that go? What to say of this character and show? I didn’t sympathize with Patrick, I didn’t pity him, I didn’t laugh at his many travails, because they were of his own making. Patrick is a trust fund baby, who spends his money like water to feed his vices, and he thinks he’s fine. Then there’s the excuse lurking around. The action that will excuse Patrick’s neediness and behavior, I know exactly how this is going to end, and I don’t think it’s worth going through five hours just to find out what happens to a thoroughly despicable character. Benedict Cumberbatch is fine, it is fun to see him play a creep, but it’s as if he’s doing a one man show and not getting much help from the rest of the cast. The episode is a slog, to see such self-destructive behavior over and over again, is difficult to say the least. Patrick recalls a trip to Lacoste France in 1967, where something horrific happened to him. So, now the audience sees what drove Patrick Melrose to his self-destructive excesses. Many people go through horribly painful events in their lives, not all of them turn into addicts and fewer still want to kill themselves with an overdose. These books and this show is glorying drug use by making it all seem like one big party, other than the withdrawal symptoms, and they become redundant too. Other than good performances from Benedict Cumberbatch and Hugo Weaving, this wouldn’t even be worth watching the story of addiction has been told many times, so what can be added, I don’t know. In 1990 Patrick attends a party thrown by Bridget (Holliday Granger) a woman he first met at the family home in France Bridget is now a countess, and has invited everyone to the party, from Patrick’s friend and fellow addict Johnny Hall (Prasanna Puwanarajah) to Princess Margaret. (Harriet Walter) Patrick makes an important admission to Johnny at the party. There is a major tonal shift in this episode, there are still flashbacks to remind the viewer of Patrick’s trauma, but it’s also a blistering satire of the idle rich, until the viewer realizes that Patrick is one of the idle rich, that makes the satire a little less effective. Still the tonal shift is a welcome change. The only issue I have with this episode is that Bridget looks the same 23 years after Patrick first met her. The makeup people should have aged her a little. The camera continues to shoot this film from interesting angles. Patrick goes to the South of France to visit his mother in 2003. He is married now with two young boys, but he still has vices, but does he indulge them? Patrick is married and has two kids, he could concentrate on them, he could make then the center of his world, he could forget about his past, and concentrate on his future. In other words, he could be an adult, but does he do that, or does he continue to live a Peter Pan life where he doesn’t want to grow up and face his responsibilities if being a husband and father? Parts of this episode is funny, but it’s also frustrating to watch. In 2005, Patrick must come to terms with his mother’s death, while continuing to self-medicate with alcohol. At last, this show is over. The viewer finally sees some consequences of Patrick’s behavior, but even the consequences are clichés , and he never quite seems to understand how his behavior affects other people. The visual direction continues to be stellar. But the story is never quite realistic enough to be gripping. Finally, the flashbacks on this episode are confusing, it is never clear when it’s 2005, and when it’s before 2005. The acting by Benedict Cumberbatch and Hugo Weaving is excellent, and that’s why I kept watching. But in the end, the story glorifies drug and alcohol abuse. In the age of rampant opioid addiction, that is a dangerous viewpoint to present. Patrick has a built in excuse for his excesses, and the consequences of his actions are only briefly mentioned and off he goes again, living his carefree, consequence free lifestyle. When Patrick actually hits rock bottom, it’s so short in duration, that it doesn’t have an impact. Cumberbatch is good, despite playing a not very likable character, either as needy addict or devil-may care alcoholic, he is kind of a cad. His character seems to think life owes him something instead of making the most of a very advantageous position. The problem with playing an amoral person is that the audience will never root for Patrick to succeed, because his goals are out of whack. So it may be a fine performance by Cumberbatch, but the character is pretty despicable. Hugo Weaving is used to being a bad guy, he played Agent Smith in three Matrix movies. Here he is relentlessly, one dimensionally evil , playing Patrick’s father David. He does the best he can, despite being boxed in by the writers. Jennifer Jason Leigh is not given much to do after the first couple of episodes. The direction is very visually stimulating throughout, the camera is used in many different angles to give the viewer a lot of different perspectives of what is happening in each episode. The downside of the direction is the pacing is very slaw, and when the subject matter is difficult, which is often,this show becomes difficult to watch. Patrick Melrose: No one comes out smelling like a rose in this show. James “Whitey” Bulger (Johnny Depp) was a small-time hood in South Boston mostly involved in selling drugs. He then made a deal with FBI agent John Connelly. (Joel Edgerton) Bulger agrees to snitch on the Angiulo crime family, in return Connelly gives him immunity from prosecution, but he asks Bulger not to kill anyone. Of course Bulger violates that agreement many times over, and that makes FBI agent Charles McGuire (Kevin Bacon) angry and frustrated. Just as McGuire is ready to end the immunity agreement, Bulger discloses the whereabouts of Angiulo’s hideout, which takes the heat off Bulger, and gives Connelly a nice promotion. But as Bulger expands his operations to jai-alai, and running guns to the IRA, more and more Bulger informants wind up dead, and new prosecutor Fred Wyshek (Cory Stoll asks Connelly why Bulger has never been prosecuted for any of his crimes, and Connelly doesn’t have a good answer to that question. Do the Feds finally capture Bulger? Do they convict Connelly for aiding and abetting Bulger’s crime spree? Black Mass tries to be an epic crime story, like the Godfather or Goodfellas, but it just isn’t that big a story. The corruption and collusion of the FBI is the story here, but since Depp is the star, and he is playing Bulger, the story has to focus on Bulger. The story is further diluted by time spent on Bulger’s wife, and the death of Bulger’s son, as well as the misdeeds of members of Bulger’s crime family. There are some good performances, but Depp’s is not one of them. He hides behind globs of makeup and adopts a Jack Nicholson type persona for Bulger, except Nicholson was much better in The Departed. Depp has one really effective scene in the film and not much else. Joel Edgerton doesn’t do well in a pivotal role as corrupt FBI agent John Connelly, he adopts a bad Boston accent and doesn’t do much else. Benedict Cumberbatch, who I like as an actor, really butchers a Boston accent, and tries to hide his British accent, it doesn’t work. Kevin Bacon delivers a great performance, as the FBI agent asking all the right questions but getting stonewalled. He’s the only actor who doesn’t try a bad Boston accent. Corey Stoll is also good as the prosecutor who tries to end the FBI corruption, and his Boston accent is more subtle than the rest. Director Scott Copper has an inconsistent record of directing. I liked Out of the Furnace, but Cooper does not do anything nearly as visual in this movie. I didn’t like Crazy Heart, Cooper’s other major film. Cooper’s pacing in this movie is slow, and he doesn’t get good performances from the main actors in the film. Black Mass: Pray you don’t have to sit through it. In 1890, 5 people are dead, and the suspect is the ghost of a bride named Emelia Ricoletti (Natasha O’Keefe) who has a big hole in the back of her head. Sherlock Holmes (Benedict Cumberbatch) and Dr. Watson (Martin Freeman) are asked by Scotland Yard to investigate. Sherlock is skeptical that the murders have been committed by a ghost, but Watson isn’t quite sure. Shortly after the murders, Lady Carmichael (Catherine McCormick) reports to Sherlock that her husband Eustace (Tim McInnerny) is being haunted by Emelia Ricoletti. Eustace later dismisses his wife’s concern, but Sherlock wants to use Eustace to bait the apparition. Complicating matters, Mary Watson (Amanda Abbington) is working for a corpulent version of Sherlock’s brother Mycroft (Mark Gatiss) and she attempts to solve the murders, putting her life in mortal danger. Does Sherlock save Mary? Does he solve the murders? I love Sherlock and this episode is no exception, I’ve always thought that the episodes were like little movies and this episode, even more so. This episode had the requisite mystery, overlaid by a supernatural element, which made the episode even more fun to watch, the writing is crisp, and crackles off the page. The writers deal with the fact that the majority of the episode takes place in the 1890’s cleverly. The characters are funny and engaging, the only flaw with this episode was the writers attempted, rather clumsily, to turn Sherlock into an action hero for a few seconds, and then realizing the futility of that endeavor, drop the idea immediately. The acting is superb. The chemistry and timing between Cumberbatch and Freeman is amazing, They really work well with each other, sometimes friends sometimes rivals, good naturedly poking fun at each other while solving the mystery. Natasha O’Keefe is sufficiently creepy as the ghost bride, Mark Gatiss is mostly comedy relief, but also plays Mycroft as a thorn in Sherlock’s side. Amanda Abbbington is funny as Mary Watson, and Catherine McCormick is intriguing as Lady Carmichael. The direction is great, visually arresting, great cinematography like a little movie. The director also gets great performances from everyone in the cast, and keeps thing moving at a brisk and exciting pace. Sherlock: The Abominable Bride. Wed yourself to the television for 90 minutes and enjoy. Smaug (Benedict Cumberbatch) is terrorizing the town of Laketown, raining fire on its inhabitants as they struggle to vanquish him. Even if Smaug is vanquished, Laketown and Lonely Mountain are beset by problems, because of the gold in Lonely Mountain, and its strategic position, both dwarves and elves claim the mountain as their own. Thorin, (Richard Armitage) King of the Dwarves is struck with dragon sickness, and is willing to fight to the death to keep the gold with the dwarves. Thranduil (Lee Pace) desires a necklace of white jewels from Lonely Mountain. Bilbo (Martin Freeman) has the Arkenstone and is willing to give it back to Thorin, to avoid war between the Dwarves and the Elves. What neither the Elves nor the Dwarves know is there are two Orc armies massing to battle the Elves and the Dwarves and take over Lonely Mountain. Will the Elves and the Dwarves unite to fight the Orcs, and defeat them? This was the only film of the trilogy that I was waiting for, the one I watched two dull movies to watch. But, the final installment of the Hobbit trilogy is oddly flat. I had no emotional attachment to any of these characters, the battle with the Orcs was inevitable and anti-climactic. The love story between Killi and Tauriel, kind of a middle earth Romeo and Juliet , held no romantic resonance. Compared to the Lord of the Rings, which had an outstanding buildup and conclusion, this trilogy lacked any complexity or ferocity. The acting is ok. Martin Freeman, who got top billing, really ended up being a supporting actor. Orlando Bloom had a very small part and did nothing significant until the very end. Richard Armitage is no Viggo Mortensen, and Ian McKellen is absolutely wasted. Aidan Turner and Evangeline Lilly don’t really have any chemistry together and so you have a good cast with a tepid adaptation of a good book. I haven’t read the book, but the movies felt long and drawn out. Ultimately, Peter Jackson has to take responsibility for this lackluster trilogy. What should have been the pinnacle of the trilogy feel more like an afterthought. He co-wrote this trilogy, and dragged the audience through two slowly paced movies. He was probably pressured to make a trilogy by the studio, but honestly he should have made two great movies and left it at that. He can’t have the excuse that there were too many characters, because there were just as many characters in the Lord of the Rings trilogy, and that trilogy was very exciting. I’m at a loss for why this trilogy was so dull, but it was. The Hobbit: The Battle of the Five Armies. Smaug and Mirrors. In 1939, Commander Denniston (Charles Dance) of the Royal Navy wants to put together a team to break the Nazis Enigma code. 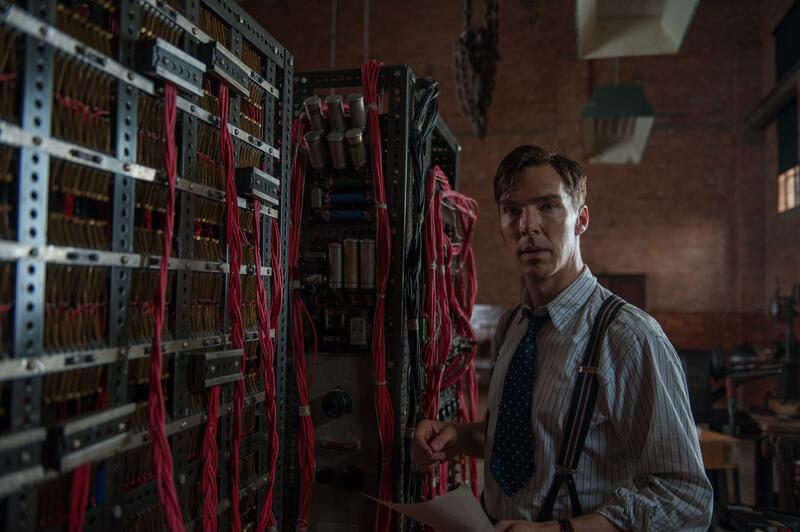 College Professor Alan Turing (Benedict Cumberbatch) Turing almost fails the interview, but is hired by Denniston. Also on the team are Hugh Alexander (Matthew Goode) John Carincross (Allen Leech) Peter Hilton (Matthew Beard) and Stewart Menzies (Mark Strong) of MI6, the British Intelligence Agency. Turing didn’t like working with others and petitioned none other than Winston Churchill himself to be in charge of the team. Turing fires two linguists and hires mathematician Joan Clarke (Kiera Knightly) to join his team. All the other codebreakers want to break the code manually, but Turing wants to build a machine to break the code. Denniston wants to get rid of Turing, and hears there’s a Russian double agent in the codebreaker group, and launches an investigation to find out if Turing is a spy for the Russians. Turing is hiding something, which is uncovered after the war. Does Turing’s machine break the code in time to help the Allies win the war? What is Alan Turing’s secret? This is an excellent movie, the story is clearly and economically told. Turing is a remarkable man who built a computer at a time when people were using pencil and paper. Turing is living a dual life in more ways than one, and he needed to keep both lives secret. The movie does an excellent job of exposing the fissures within the codebreaking team, and the hardships facing England at the time. The fact that Turing hired Joan Clarke, a woman, at a time when women weren’t considered for such positions is noteworthy, and the film highlights this achievement. What happened to Turing after the war is shameful, and that is perhaps the most powerful part of the film. The acting is superb. Cumberbatch gives Turing a stuttering, stammering manner which befits Turing’s shyness, which was often mistaken for standoffishness. Cumberbatch richly deserved the nomination, and could have easily won the best actor Academy Award. Charles Dance is excellent as Commander Dennison, who is a by the book Navy officer and is openly contemptuous of Turing’s outside the box thinking. Mark Strong also gives a standout performance as the MI6 agent who helps Turing navigate his way through military and civilian leadership. Knightly is the revelation here, when I first heard that she was in this movie, I thought she was in way over her head, but she handled a complex role of a trailblazing woman quite nicely. The direction is good. The pacing is excellent, the flashbacks to Turing’s school days, and then forward to the post war days are excellently placed. The Imitation Game: The real thing. Meanwhile, Gandalf has split from the group with Radagast (Sylvester McCoy) to find the Necromacer, also known as Sauron. Before getting to Lonely Mountain, Bilbo and the dwarves must go through the burgh of Laketown with the help of Bard, (Luke Evans) to get weapons. Thorin also tries to negotiate the return of Laketown to the dwarves, Thorin promises to share the gold from Lonely Mountain with the people of Laketown. They accept Thorin’s proposal. By the time Bilbo and the dwarves gets to Lonely Mountain, the sun is setting, and they cannot find the keyhole. Bilbo has the ring which gives him invisibility, but will he get a chance to use it against Smaug? Does Gandalf find Sauron? The last 40 minutes if the Desolation of Smaug is well worth watching. The chemistry between Freeman and Cumberbatch crackles with tension. Getting to that last 40 minutes, however is a long, hard slog. Peter Jackson has again taken a simple story, and made it a bloated, unrecognizable mess. He could have scaled back on Legolas and Tauriel, he could have scaled back on Laketown and skipped the love triangle between Legolas, Tauriel and Kili altogether, but all the minutia was there. I haven’t read the Hobbit or any other Tolkien, but all the minutia made for dull watching. The problem is, every sci-fi movie since Star Wars has to be an epic trilogy, the Lord of the Rings was an epic trilogy, so the movie makers, for purely pecuniary reasons, made the Hobbit a trilogy, and it’s the audience who suffers. The Hobbit movies also suffer by comparison to the Lord of the Rings trilogy which was a rich tapestry of story and characters, which built to an incredible climax, the Hobbit will never match the magic of the Lord of the Rings movies. The acting is fine, especially by Cumberbatch, Freeman, and Ian McKellen. The movie is best when the three are on screen. When the movie shifts away from the three characters they play, the movie suffers. Evangeline Lilly and Orlando Bloom do their best, but their storyline just didn’t interest me. Richard Armitage is pretty forgettable as Thorin. 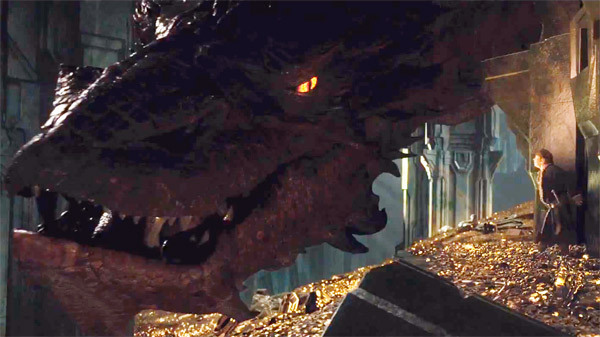 The pacing is very slow at points, and I noticed that the landscapes, which were pretty spectacular in the first Hobbit movie, were somewhat ordinary, the CGI budget seemed mostly to be poured into the talking spiders, and Smaug, and I must say, Smaug is a special effects marvel, but still not spectacular enough to maintain a 2 hour and 20 minute movie.